Here’s another quick tip that demonstrates how to slow down your cloth simulations. This technique can be used with any animation that involves deformation at a point level. Have fun! For those of you that are wondering about the mesh I used for the Luxx logo, here is an editor view (unsmoothed). You can see that I have modelled the shape quite evenly and not taken an extrudeNURBS made editable (click on the image to see full size). When working with cloth you should always model with this in mind and try to keep your mesh nice and evenly balanced. The cloth will tend to react more naturally that way. Would it be possible to also go into the project settings and just set the time to half the speed?? @David – I don’t think using a higher frame rate will result in the same slow motion effect. Also adjusting the frame rate will affect every animated object in your scene, using point cache will allow you to control the speed on individual objects. Great tutorial, thanks! Don’t stop! Impressive Blog Tim. Impressive tutorials and knowledge. I´m a begginer, and therefore, a little bit afraid to ask but I don´t want to stop here. When I try to make rebound some other pieces I modeled, all the poligons crash and split. Good for a car crash but I don´t achieve any rebounding at all. Why is that? How can I get my models to react in a “compact” way? I hope I´m making sense. @eternal1964 – You need to make sure the mesh has a good structure, lots of small triangles or long thin triangles will not work too well for very stiff cloth and the mesh may well collapse. didnt know about the point cache. You are a fantastic teacher, I’m going through MILG6-7 now. This was another excellent lesson! That is one of the funniest replies I’ve ever read.. Nice one! Made me laugh out loud. Again nice tutorial! Results look pretty descent but I’m always a bit afraid of using cloth because of its unpredictable nature. But in your tutorial the results look very smooth. How come letters with radiuses just fall into mush. Is there a way to fix that in the cloth tag. @Rob You need to make a nice even mesh, if you just use an extruded spline that you made editable, then you need to connect all the points and optimise. However the long irregular triangles will cause problems, so use regular grid on your caps or even better, model the shape by hand. something that I have not been aware at all. Slo Mo Clothilde – Here I come. @seth You need to connect and then optimise the mesh when you convert a text or extrudeNURBS object to polygons. The caps are separate parts, optimise will weld the points together. I did optimize my text before I but the cloth tag on, I even double checked to make sure i did. I also did what you said and any text I use with a radius like R it falls to mush but if its a letter such as T or H no problems. Tim…ahhhhhh soooo I did this with two things touching and they just started attacking each other. I want them to bounce off each other. They start attaching to each other. I tried changing the point, edge and polygon collision numbers but it just got worse. Any thoughts. P.S. I want those glasses. Don’t have them touching, but place a gap between them. Then use a force to push them together, then they should bounce off each other. However with cloth you’ll probably find that you need to cache one of the objects first then use that as a collision object. Hi Tim, great tutorial! I’m testing this out and I thought it would be nice to animate the scale property in the Point Cache tag to slow the whole thing down on impact. This doesn’t work since if I animate the scale value to say 50%, the object animates to the position it would have if the whole animation was at 50%, and then continue (so, while falling, it first travels back up). Do you got any thoughts on how to acheive this, while using your descriped technique? thanks for the great tutorials so far! Ah, I already found a way of achieving this. I used 2 point cache tags, the first at 100% and the second on top of that at 25%. I synchronized the frame of slowing down using the offset parameter on the slow point cache tag and animated the enable parameter to switch between the fast and the slow animation. The drawback is that it’s an instant effect, it’s not possible to gradually slow it down. ..or is there a better way of doing this? Tim, I would love to see the wireframe of that Luxx logo. It seems like it has fillets. It’s almost impossible to make the topology of an object similar to Luxx logo to be uniform. I’m like couple of hours away from discounting the cloth feature in C4D as useless since complex objects will always have differing topology. I’ve been at it for days and there’s just no way to get it to behave the way I want no matter how much iterations (to make it stiff) I throw at it. @Ulash – You are correct that the topology should be as even as possible. If you know something is going to be used as cloth then it helps to model it with that in mind. 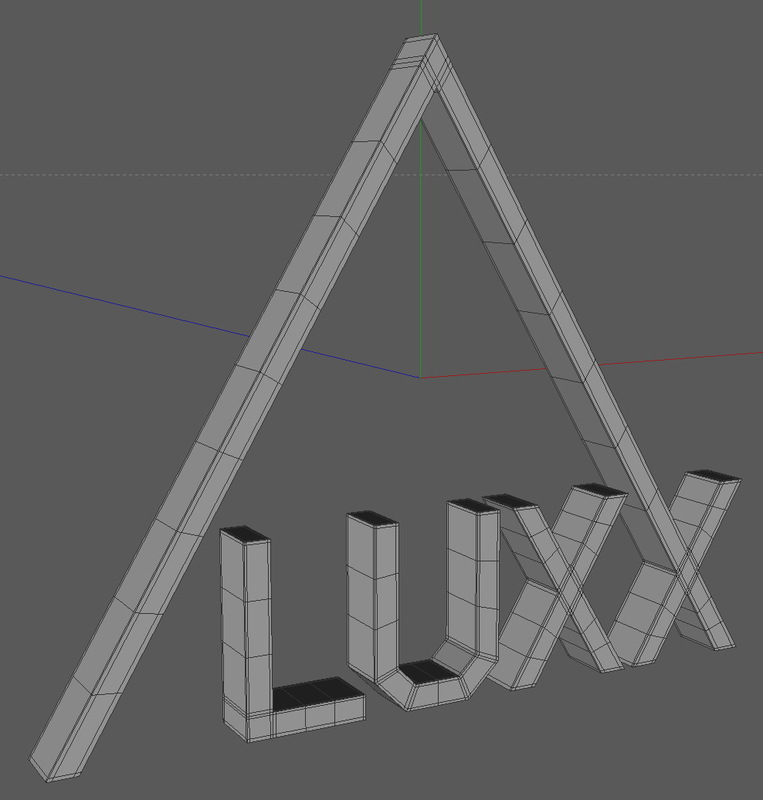 I have added an image of the Luxx logo as unsmoothed editor view so you can see how I modelled it. Thank you for taking your time and replying to my question. You are the best!! Keep the tutorials coming. I’m looking forward to MILG 8. Is there a better solution in C4D 12 with the soft tag? I am trying to get the same jelly effect on a mograph text, but my characters break up. Any advice on that? @Ricardo It is because internally the caps are separate from the extrude. So you can either make editable and then connect, or you could try using the connect object to get around this. I have been trying that but with little success, but after your advice at least now the text is not breaking! I suppose I have to work on the geometry to have a nice flex. Oh.. I tried to Make Text Like Luxx logo rubber but i miss solution so i take my text from 3D max after make extrude to text then 4 segment at 3d max then with export .obj i made it ,, but the problem with C4D i want to be in this program i don’t need 3D max to do it i hope to find solution with Extrudenurbs thanx anyway..
I’ll have to let my daughter see this – she’s just started learning this stuff in her college course. Saved my day! that was very helpful! Thanks for the knowledge ! I’m wondering, is it possible for me to use cloth on an object that already has a point cache going? I’m doing an experiment in trying to unroll a rug or banner. Using cloth alone yields some ok results, but its kind of like the roll falls down and straightens out as opposed to actually unrolling in a cloth-like manner. So I thought, maybe I can roll it up with a bend deformer, animate that, then point cache it. The add a clothide on top maybe? do you think this would work? @Quentin You could use Cloth as an absolute morph target. Make a duplicate of your mesh that is unrolled and then add cloth to this. Hide it and then add a posemorph tag to the original mesh. Drag the cloth object as an absolute morph target, then you can blend the cloth into the original mesh. Personally I probably wouldn’t use this method for your carpet, you will have more control using something like a jiggle deformer or delay effector (set to deform points).